In the twentieth century, free people faced a number of mortal threats, ranging from despotism, fascism, and communism to the looming menace of global terrorism. While the struggle against some of these overt dangers continues, some insidious new threats seem to have slipped past our intellectual defenses. These new threats are quietly eroding our hard-won freedoms, often unchallenged and, in some cases, widely accepted as beneficial. 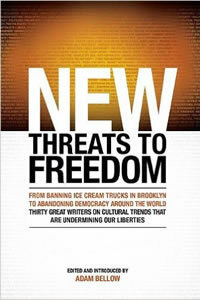 In New Threats to Freedom, editor and author Adam Bellow has assembled an all-star line up of innovative thinkers to challenge these insidious new threats. Some leap into already raging debates on issues such as Sharia law in the West, the rise of transnationalism, and the regulatory state. Others turn their attention to less obvious threats, such as the dogma of fairness, the failed promises of the blogosphere, and the triumph of behavioral psychology. These threats are very real and very urgent, yet this collection avoids projecting an air of doom and gloom. Rather, it provides a blueprint for intellectual resistance so that modern defenders of liberty may better understand their enemies, more effectively fight to preserve the meaning of freedom, and more surely carry its light to a new generation. Contributors include: Anne Applebaum, Bruce Bawer, Peter Berkowitz, Max Borders, Richard A. Epstein, Jessica Gavora, Michael Goodwin, Daniel Hannan, Alexander Harrington, Mark Helprin, Christopher Hitchens, Robert D. Kaplan, James Kirchick, Greg Lukianoff, Barry C. Lynn, David Mamet, Katherine Mangu-Ward, Tara McKelvey, Mark T. Mitchell, Michael C. Moynihan, Chris Norwood, Glenn Harlan Reynolds, Naomi Schaefer Riley, Christine Rosen, Ron Rosenbaum, Stephen Schwartz, Lee Siegel, Christina Hoff Sommers, Shelby Steele, and Dennis Whittle.